Lots of chocolatey goodness in this month’s We Should Cocoa. As we had a nice easy holiday theme of Anything Goes, there’s even more of a diversity of entries than usual. The one thing that unifies them is their delectable demeanour and desirability. As this wasn’t a specific challenge, I was a bit more relaxed about the rules this time and I’m doing the round-up a little differently. Please do visit some of the blogs and share your appreciation there, it’s the feedback we bloggers get that keep us going. Next month Kate over at The Veg Space will be hosting We Should Cocoa, so do hop over to her blog on 1 September to see what she has in store for us. I’ve had a busy month and completely forgot WSC. The irony is that I had bakes I could have added to the link-up! So many great looking dishes here! oh yes… too many (is that possible) chocolate treats for me to salivate over… a lovely lovely job! Even the best of us can have too much chocolate sometimes – or so I’m told. OMG all wonderful, I haven’t been baking much with cocoa or chocolate recently, but i have been making drinking chocolate with proper chocolate melted in hot milk – maybe I should have been cheeky and entered that. As always lovely delicious round up. Hot chocolate made with real chocolate is definitely welcome Shaheen. I quite fancy a mug of that myself right now. It might make for nice chocolate filled dreams Johanna – there are worse things. What a lovely selection…oh that that was a buffet and I had a big plate! The trouble I find with these round-ups is that I usually want to try everything Lucy and it’s just not possible – very unfair! Oh my goodness what a range of the most delicious chocolate bakes around. I want to eat them all. Have to decide which one to make first. Thanks Sisley, that’s a very tough decision to make. lovely array of chocolatey goodness here – my eye was caught by quite a few of them, but the marquise is on my to make list anyway so will go check Janey’s post! That marquise does look rather wonderful Nazima. I’ve made one before, but it didn’t look as good as that one. What a fine abundance of varied entries. I can see that there’s no danger of chocolate becoming unpopular any time soon. Thanks for keeping this lovely challenge going. Haha, you’d need a massive appetite to try a bit of everything here, but I know what you mean. Yes Tracy, virtual eating isn’t nearly as satisfying as trying the real thing. Your kittens are just fabulous. What a great round up, Choclette! 🙂 I love cocoa and this all looks so delicious! Thank you for including my overnight oats. So many gorgeous chocolate treats. Especially the chocolate cake with oreo..yum! Bookmarked. Thanks for joining in Sarah. These round-ups are great for inspiration. Oh gosh, when you put it like that, it does make us seem like a greedy lot Kate. Looks like cocoa/chocolate goes everywhere!! Oh there is so much to drool over here. I haven’t had breakfast yet and my tummy is possibly rumbling…Awesome round up. These hurt my eyes, they are so good. I really really want to eat the mini black forest cakes. They look amazing. Goodness, I actually managed to enter twice! I don’t think that has ever happened before! Great round up, so many entries – chocolate galore! Omg...which one I should pick and make...Thts really an amazing collection... Thank you for sharing this wonderful recipes. 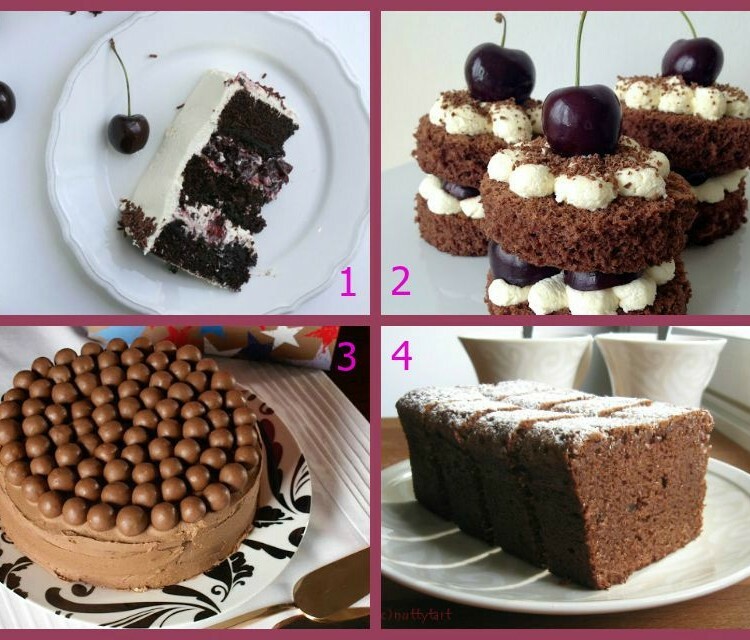 Omg…which one I should pick and make…Thts really an amazing collection… Thank you for sharing this wonderful recipes. Wow.. so many goodies.. lots can be done with cocoa. Oh wow! I love chocolate and this post is a treasure of so many delicious and gorgeous looking recipes! Thank you Madiha, I hope you find something you might like to try making. What a fantastic selection – they all look gorgeous. I need to bookmark this page for the next time I need a chocolate cake fix! There’s a great selection to be had for sure Helen and they all look so tempting. What a huge selection of so many tasty treats!! A very nice collection for sure! Chocolate is so amazingly versatile Kecia, I don’t think we will ever run out of new recipes.